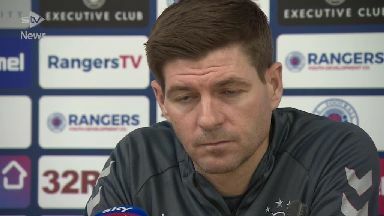 Steven Gerrard reveals Colombian striker has accepted his club fine for the sending off. 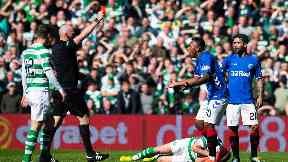 Rangers boss Steven Gerrard revealed Alfredo Morelos has accepted his club fine for picking up a fifth red card of the season in Sunday's Old Firm derby against Celtic at Parkhead. The Colombian saw red for an off-the-ball elbow on Hoops skipper Scott Brown in the Gers' 2-1 defeat and will now miss the next four games through suspension. Morelos, who had one of his red cards rescinded, posted an apology on his Twitter account on Monday and Gerrard said on Tuesday morning: "He has shown remorse and accepted the punishment I have given him. "We spoke to his representation as well and everyone is on the same page. "Now it is just a decision for the club to decide where the fine goes to but Alfredo has accepted, shown remorse and apologised." Gerrard added: "I think he made that public himself which is the right thing to do and we draw a line under it. "Moving forward we hope Alfredo learns the hard way and we wait now for him to return to help us in the final push." The former Liverpool and England captain also revealed the steps he will take to help Morelos change his ways. He said: "Other players around the world and players I have played with have been in a similar situation to Alfredo. "With experience and time they learn and improve their discipline. "We hope that is the case with Alfredo, we hope he learns and improves that side of his game because if he does he will be regarded as a top player. "If he doesn't then he is at a big risk that people's opinion of him won't change. I have had one-to-one chats with him, with his people. "Being there for him to talk and ask and using his close friends and allies in the team. Showing him his behaviour, showing him examples of other people in similar situations, myself included. "I had a good look in the mirror. You accept your own actions and be responsible for them and you have to think of other people. "The first thing Alfredo has to do is think about his team-mates, think about what they have to go through without him, think about what the supporters have to go through when the top scorer has to leave the pitch with many minutes left and they can't watch him for four games. "I will continue to support and help him, he is still our player, a top player and still has a lot to offer this football club. "But at the weekend I had to be firm and stamp down and I think he understands that. I think the other players understand it. I think it needed it. We have addressed it and we move on."